Do you buy shoes? Then do not forget to buy a good shoeshine set. 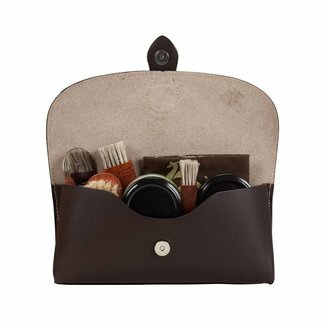 Nothing is as convenient as a complete set, so you have all basic necessities on hand to maintain your shoes. 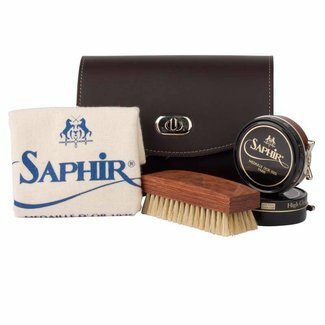 A set most often consists out of a good polishing cloth, brushes and shoeshine. At Quality Shop you will find several shoe maintenance sets online. From a simple to a very extensive cleaning set. 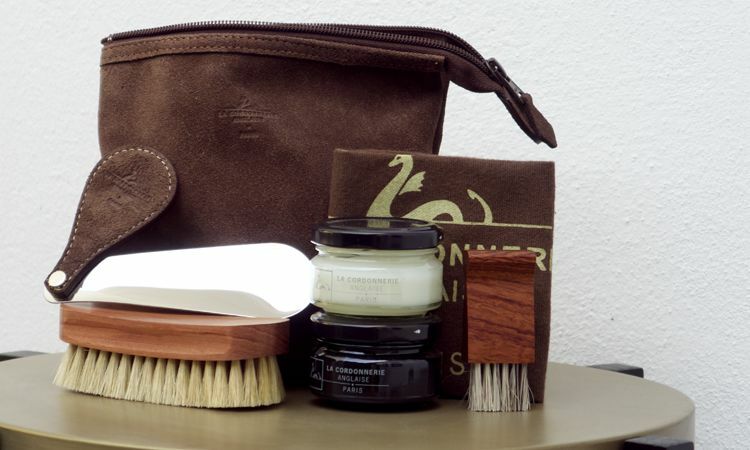 Luxurious shoeshine sets are not only very practical, but also very beautiful. The luxurious set consists of high-quality products for which only the best materials and ingredients are used. 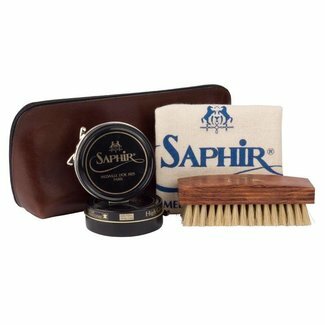 An example of a luxurious shoeshine set is the Clipper from the French brand 'La Cordonnerie Anglaise'. 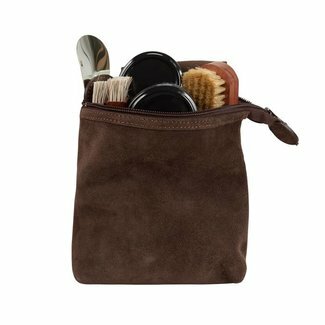 A beautiful leather pouch is filled with several formats of brushes, a shoehorn, a polishing cloth and two colours of shoeshine. A feast for the eye, yet still very handy. 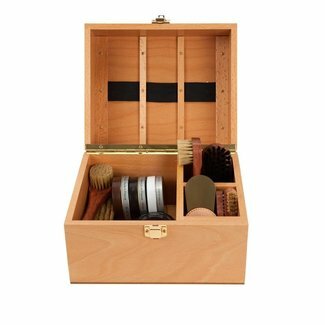 A good basic set contains everything you need to shine your shoes. 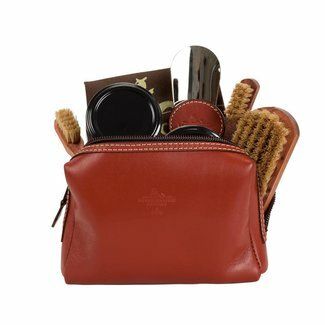 Take for example the leather pouch filled with a polishing towel, a brush, and two tins of shoeshine. This is an ideal basic set to bring your shoes in top condition quick and easily. 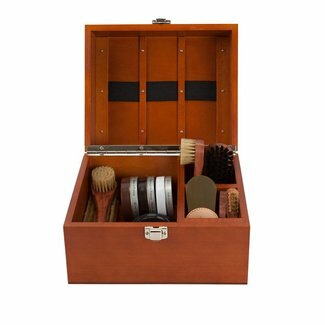 In our webshop you will find several basic sets, that are not only practical to have at home, but that can also be used as traveling shoeshine sets. A cleaning set is indeed essential if you are fond of wearing leather shoes, after all, this material asks for nutrition and care. Hence why we have a nice Saphir shoeshine set sale for you. To see the offers you can click here. 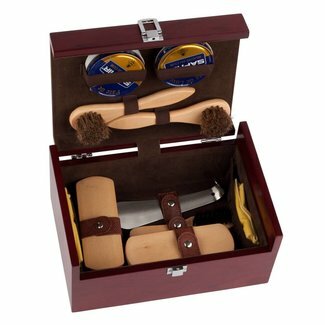 Here you have the choice of several shoeshine sets that you can easily order online. Good to know is that most parts of the sets are also available separately. This way you can always supplement your set. 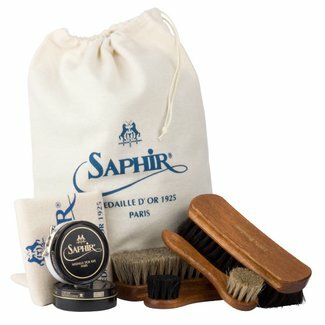 Do you have questions about the shoe maintenance sets? Then feel free to contact us.